Werder temporarily moved to Bidvest Wits' training pitches after heavy rainfall (Photo: WERDER.DE). Werder had to move to Bidevest Wits’ training pitches on Tuesday after the Randburg AFC pitches were waterlogged following heavy rainfall. Despite the longer journey, nothing changed for the Green-Whites regarding their training programme and the team were able to return to their original training pitches on Wednesday. 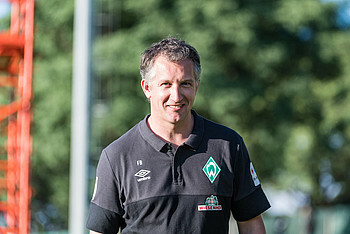 “Of course it isn’t ideal to change location for training but I never experienced perfect conditions in my long footballing career,” described Werder sporting director Frank Baumann. “We can improvise and are very open to new ideas. This change in location doesn’t change any of our training schedule,” he added in his interview with the media. Frank Baumann remains optimistic despite the change in location (Photo: nordphoto). The effort in organising the trip to South Africa has now paid off, as there was scope for flexibility in the trip. Werder can adapt their plans accordingly with the weather and make the most of their time in South Africa. “Ahead of the trip, we did everything we could to prepare for any given situation we would encounter. Consequently, there were no issues in changing where we trained for Tuesday and additional days if necessary,” says Baumann, who visited South Africa a few months ago to visit the prospective locations where the Werder squad would train. The Green-Whites are also open to changes in their preparations for Friday’s friendly against Bidvest Wits (16:45 CET live on Facebook and WERDER.de), to take as much out of the friendly as possible. “We are very flexible regarding the location and timing of Friday’s friendly. We will improvise if necessary. However, this certainly won’t change the team’s training patterns nor impede their hard work,” said Baumann.